Why invest in a Windows Desktop Search toolAccording to International Data Corporation their survey reveals that information worker you spend most of their time performing document-related activity. Here are some interesting facts on how workers spend their time:5 hoursweek searching for documents.2.3 hoursweek searching for but not finding documents.Thats at least 2.3 hours of hours wasted per week for having not the appropriate tools. According to their studies time wasted in document creation and management activities costs the organization $ 9071 per information worker per week. Thats a lot in a year when you can install a tool such as Copernic Desktop Search for the price of $ 49.95 USD per license. Highly recommendedCDS has become the worlds #1 Windows desktop search tool for PCs. For the past 10 years companies have switched to Copernic Desktop Search because of its easy-to-use instant and reliable search engine.A track record you can trustCopernic has been in business for 20 years. 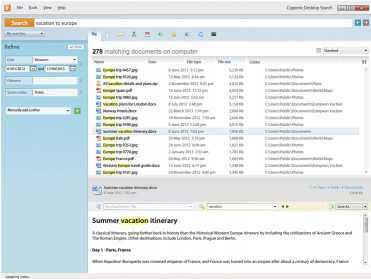 Our job is to help you search your documents faster.Install it yourselfCopernic Desktop Search is a standalone software with a very simple installation process. Anyone can install it and it works on computers with very basic requirements.How safe is your dataWe know how valuable your information is and we make sure that the information is kept in your environment. Copernic Desktop Search does not allow the transmission of your keywords search results or their content back to Copernic. 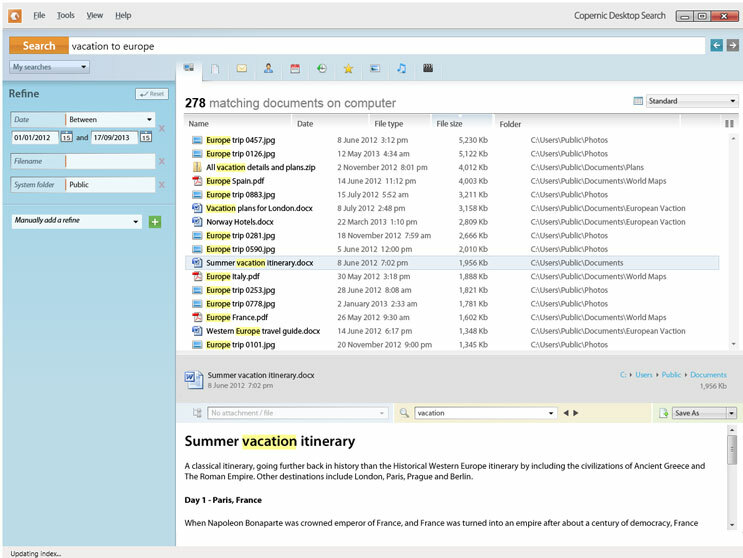 Therefore we do not see what you are looking for or the content of your documents.Who uses CopernicFrom home users to small businesses to mid-sized companies to major corporations Copernic Desktop Search has become the go-to Windows desktop search tool for PC users worldwide.